The new 2016 iPad Air 3 is expected to turn around the iPad behavior. 4K display with 2334 x 3112 resolution makes it the most stunning iPad for playing movies videos. What about iPad Air 3 supported video formats? Will Apple new iPad play MTS M2TS MKV or HD/4K video? Below we list the supported video format list, and provide a solution to play unaccepted video formats on the new tablet without trouble. Free download iPad video converter to lossless convert any video to iPad supported video file format, and play MTS M2TS MKV FLV files on iPad Air 3/iPad Pro 9.7 effortlessly. * Motion JPEG (M-JPEG) up to 35 Mbps, 2334 x 3112 pixels, 30 frames per second, audio in ulaw, PCM stereo audio in .avi ﬁle format. * AAC (8 to 320 Kbps), Protected AAC (from iTunes Store), HE-AAC, MP3 (8 to 320 Kbps), MP3 VBR, Audible (formats 2, 3, 4, Audible Enhanced Audio, AAX, and AAX+), Apple Lossless, AIFF, and WAV. The video and audio formats are almost the same as what the previous generation supports, but the video resolution will be much higher and up to 4K UHD. You can play MP4, MOV, AVI, M4V on your latest iPad if with the right codec. To play media file that is out of iPad Air 3 accepted video formats, you need third party help, video converter for iPad, which I'll explain in the next part. How to Convert Any Media File to iPad? How to play MTS M2TS MKV FLV AVCHD and other HD/4K video files on iPad Air 3? The simplest solution is to change these file format to iPad Air 3/new iPad Pro supported video formats. MacX Video Converter Pro makes the cut. It works great in various video to any video audio formats iPad Air 3 supports, like MTS to MP4, AVCHD to MOV, HD 4K UHD FLV to AVI etc. The "zero quality loss" is worth a thumb up. "World's fastest conversion speed" is a well received feature thanks to Intel Quick Sync hardware acceleration tech, making it 5X faster in video conversion. It is extremely easy to get hang of it. Follow the guide below to convert video to Apple tablet accepted video formats. 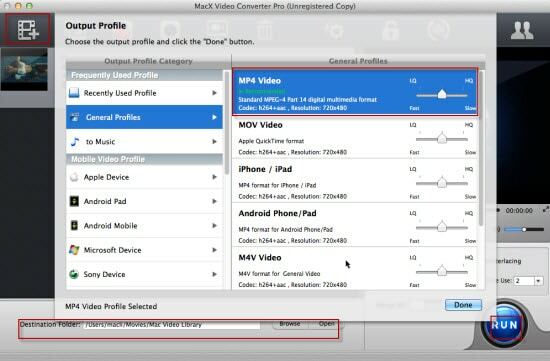 Step 1: Free download the iPad video converter for Mac or for Windows and run it. Click "Add Files" icon to load the video file from your local hard drive, USB etc. Step 2: Just choose MP4, MOV, or M4V. You can directly head to "to iPad video" and select iPad Air 3(H.264) or MPEG 4 as output. Step 3: Click "Browse" to select a folder to save output files. Step 4: Click "RUN" button to start converting video to the new tablet. How to Play DVDs on iPad Air 3? No tablets can play DVDs directly so far, even Apple's tablet has no ability to play DVDs. But how about watching DVDs on iPad Air 3. 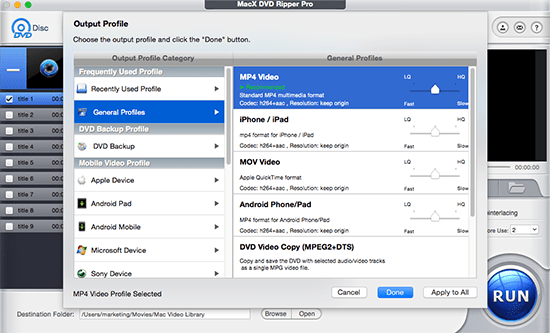 MacX DVD Ripper Pro can rip both non-protected and copy protected DVDs to M4V, MOV, MP4 etc. with original DVD quality kept. It bypasses any copy protection tech used in DVDs, Disney DRM, Region Code(1-6), CSS, UOPs, Sony ARccOS and more. For DVD ripping, load DVD, choose output video formats iPad Air 3 supports, and start ripping.